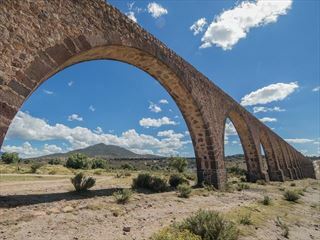 Unearth Mexico’s mystical treasures on a 14-night comprehensive tour that takes you from fiery Mexico City to wonderfully diverse Playa del Carmen, with plentiful stops along the way. We’ve got all the best bits covered and more, so you’ll discover culture and landscapes in this fascinating country. Tick the incredible Mayan city of Chichen Itza off your bucket list, along with the magnificent temples of Teotihuacan and visit traditional villages in delightful San Cristobal de las Casas, with colourfully dressed Maya folk. Taste delicious food, as fiery as you dare, and learn the art of Mexican cooking. 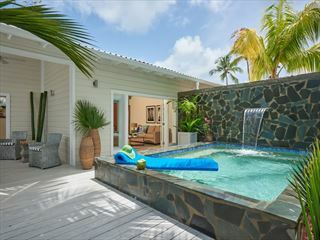 Chill out on white sand beaches, snorkel amongst the corals in the shimmering Caribbean waters and browse through bustling market places. There are waterfalls and volcanos to explore and museums, churches and archaeological sites galore. Nature lovers, history buffs and culture vultures will all love this tour, with something for everyone. Raise a glass of margarita in celebration of the Epicurean delights that lie in wait for you, with a fabulous street-food scene and some super rest and relaxation once you hit the white sands of Playa del Carmen. Come prepared for a few long travelling days and be sure to bring suitable footwear for the guided tours of archaeological sites. Some days can be quite strenuous, especially in the heat, so drink plenty of water and you’re sure to have a great time (INT - QVKD). Arrive at Mexico City’s Benito Juarez International Airport for a complimentary transfer to your hotel. After check-in, perhaps get your first taste of Mexico City as you head out on a stroll in the exciting capital. There will be a Welcome Meeting at 7pm, so go and meet your group leader and travelling companions. There will be an optional group dinner at a nearby restaurant tonight. Overnight: Hotel. Meals are not included today. Today, you’ll enjoy a guided city tour that incorporates the Metropolitan Cathedral, Zocalo, National Palace and Museum of Anthropology. You can then spend the day doing whatever you like. Taxis are relatively inexpensive in Mexico City. Grab an Uber Taxi for approximately £6.00, to take you to the La Casa Azul (Frida Kahlo Museum). If you fancy a bit of Mariachi music, the Plaza Garibaldi is only one kilometre away or you can visit the Leon Trotsky Museum. If you fancy getting out of the city, why not take a trip to the canals and gardens of Xochimilco? An Uber taxi here should cost about £12.00. Today, you’ll be travelling 50 kilometres northeast to visit the ancient and mysterious site of Teotihuacan, ‘The City of the Gods’. You’ll discover the amazing Aztec ruins of the Pyramid of the Sun and the Pyramid of the Moon and get to take a stroll down ‘The Avenue of the Dead’. Tonight, you will spend your last evening in Mexico City. En-route to Oaxaca today, you’ll visit Puebla, a rapidly developing town with a colonial heritage. If there’s time, you can visit the local markets and shop for beautiful hand-painted tiles. 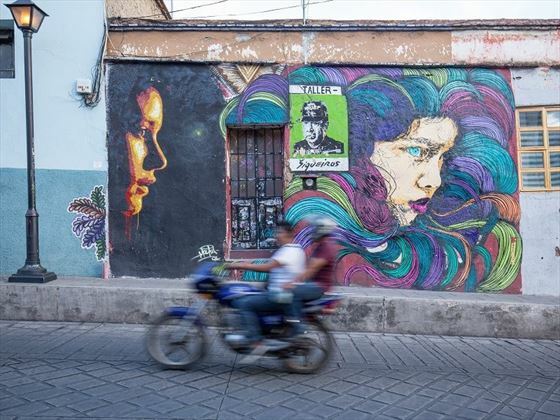 Once in the stunning colonial city of Oaxaca, you’ll see why it’s well-known for its food and art credentials. Browse for traditional Mexican handicrafts in the shops and markets and check out the brightly woven shawls and blankets that are sold by descendants of the Zapotec and Mixtec Indians. 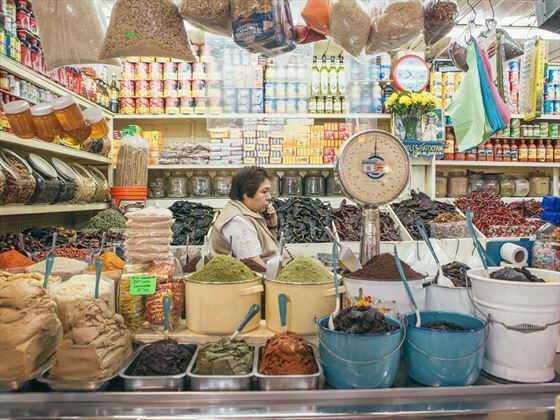 This relaxed city with its artistic vibe, has a great culinary scene, so why not try some banana-leaf-wrapped ‘tomales’ and spicy baked chilli and lime grasshoppers whilst in Oaxaca? This morning, you’ll go on a city tour of Oaxaca, to see Santo Domingo Church, Zocalo, and some lovely local art and craft galleries. If time permits, you can have lunch in the colourful 20 de Noviembre market and take your pick from all sorts of delicious cuisine. This afternoon, you’ll visit the nearby village of Teotitlán del Valle, renowned for its colourful woven rungs. You’ll get to see them being made at a local workshop and demonstration. Your day will come to a pleasant end at an artisanal mescaleria. Be sure to try some mescal – the best in the area. Salud! Today is free for you to explore Oaxaca at leisure. Perhaps pay a visit to the archaeological site of Monte Alban? 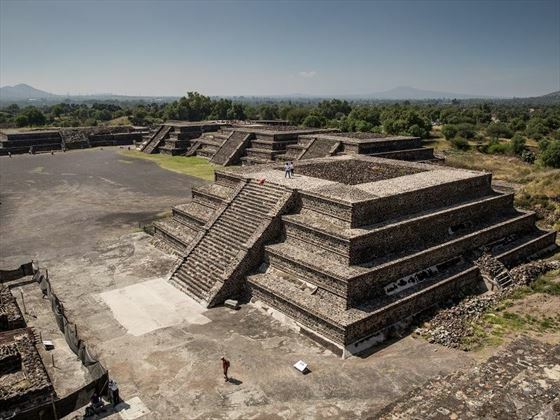 The Zapotec civilisation began construction of this city around 200 BC. Have your camera ready, for amazing shots across the three legs of the valley of Oaxaca. 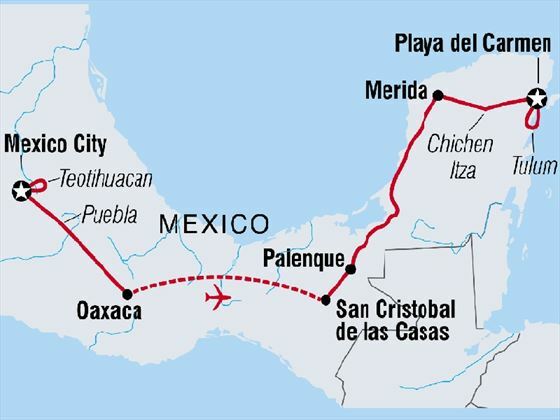 Today you’ll fly from Oaxaca to Tuxla Gutierrez and by road to San Cristobal de las Casas. After a 1.5 hour drive you’ll arrive in "SanCris", where you can take a walk on winding cobblestone streets to soak up the old-world vibe of this town and its grand Spanish colonial architecture. Perhaps visit Sumidero Canyon, an 800-metre-deep canyon carved out by the Sumidero River. It's nearly as old as the Grand Canyon! 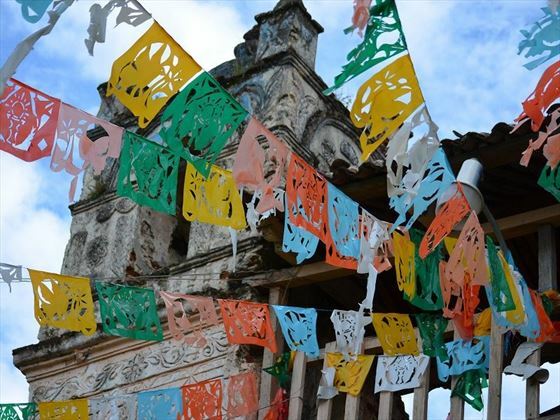 Explore the Mayan villages of San Juan Chamula and Zinacantan. Nestled in the highlands, these villages serve as marketplaces and religious ceremonial centres for the people living in the surrounding hills. See the locals in their colourful and distinctive clothes going about their traditional way of life. Enjoy some free time in SanCris and explore the town. Perhaps visit the Na Bolom Museum, which was the home of anthropologist and photographer Gertrude Duby-Blom and her archaeologist husband Frans Blom. Or, you may want to visit the amber (jade) museum, which displays and aslso sells beautifully carved items and insect-embedded pieces. Leaving San Cristobal de Las Casas, you’ll be heading for Palenque. On the way you'll visit Misol-ha – a fast-moving waterfall where you can see water plunging and crashing into the pool below. You’ll also visit the Agua Azul to see it trickling more languidly over the limestone rocks. Pack a swimsuit so you can enjoy an afternoon dip in the waters. There will be free time for you to explore the town of Palenque today too. Make an early start today and visit the archaeological site of Palenque. Located on a hilltop within the jungle, you’ll witness the region’s remarkable Mayan ruins, dating back as early as AD 600. Enjoy a guided tour of the site and as you explore this lost city, listen out for the eerie calls of howler monkeys, echoing through the jungle. This afternoon you’ll drive for about eight hours, heading north to Merida. Admire the scenery of settle back for a power nap, your destination is worth the drive! After breakfast this morning, you’ll head west to the coast, to pick up a boat which will take you across to the Celestun Bird Sanctuary and Biosphere Reserve. Look out for many varieties of coastal birds along the long stretches of beach and among the coconut trees. Between November – March, you might get to see a bright pink swathe across the landscape, as thousands of flamingos flock to the area. This afternoon, explore Merida at leisure. Perhaps check out the museums, including the impressive Regional Anthropology Museum of the Yucatan, and stroll the city streets that are full of art and culture. The Plaza Grande is a pleasant shady spot to relax awhile and has a 16th-century cathedral on one side and City Hall, State Government Palace and Casa Mantejo on the other. Stroll along the mansion-lined Paseo de Montejo and explore the outdoor market with its colourful hammocks and Mayan replicas. Sample some local cuisine and try some mind-blowingly spicy El Yucateco hot sauce. You may also like to visit the ancient ruins of Uxmal and see the amazing Palace of the Governors, which is considered to be one of the best examples of Mayan architecture. Chichen Itza is our first stop today and an unmissable Mayan site on any visit to Mexico. Explore the marvellous Temple of Kukulkan and the ‘ball court’ and much more. After your guided tour you’ll be heading to the resort town of Playa del Carmen. Today, you’ll spend the day exploring the Yucatan Peninsula. 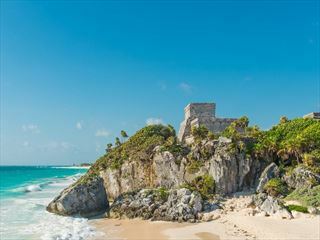 The ruins of Tulum are just an hour away and sit on a cliff overlooking a white sandy beach. A cooler spot for enjoying Mayan ruins, it may be possible to have a dip or paddle in the sea. The views and photo opportunities as you wander around are lovely. Soak it all up as you learn all about the castle, temple and numerous other structures at Tulum. Travelling back to Playa del Carman, have the dip of a lifetime in a hidden cenote. Perfect for a refreshing swim, these stunning natural sinkholes are filled with crystal clear fresh water and are quite an experience. Today, you’re free to continue exploring the Riviera Maya or simply relax at the beach sipping a Margarita or two. Your trip comes to an end this morning after breakfast. Mexico City: City Tour, Metropolitan Cathedral, National Palace and Diego Rivera murals, National Museum of Anthropology, Teotihuacan archaeological site. Puebla: Visit Puebla on route to Oaxaca. Oaxaca: Guided city tour, Mezcaleria, village tour, including Teotitlan. San Cristobal de las Casas: Mayan villages tour inc. San Juan Chamula. Palenque: Misol-Ha and Agua Azul waterfalls, Archaeological site guided tour. Merida: Celestun Bird Sanctuary. Chichen Itza Ruins: Entrance and guided tour. Tulum: Tulum Ruins. Playa del Carmen: Cenote (sinkhole). Please note the minimum age for this tour is 15 years old.